64 THE SHOP JANUARY 2019 \\\\\\\\\\\\\\\\\\\\\\\\\\\\\\\\\\\\\\\\\\\\\\\\\\\ \\\\\\\\\\\\\\\\\\\\\\\\\\\\\\\\\\\\\\\\\\\\\\\\\\\ he Mopar brand stampeded into the 2018 SEMA Show with a new 1,000-hp crate motor nicknamed Hellephant. The 426-ci supercharged engine offers 950 foot-pounds of torque, and received plenty of attention from media and show-goers alike. "Our enthusiasts crave power and per- formance and our new Hellephant Mopar crate Hemi engine and kit deliver huge horsepower and torque in a plug-and- play package," says Steve Beahm, head of parts & service for Mopar and passenger car brands for FCA North America. "The 1968 Dodge Charger is one of the hottest classic cars, which is why we decided to use it as a starting point for the Super Charger concept. It's an amazing vehicle and a great showcase for our Hellephant engine." The engine hits the magical 1,000-hp mark via bulked-up displacement, with 4 inches of stroke and bore specs at 4.125 inches. An improved supercharger with a high-efficiency rotor is mounted on the all-aluminum block, which provides weight savings to keep the Hellephant light, according to Mopar. The all-aluminum block, used in Mopar Dodge Challenger Drag Pak race vehicles, was configured for the street in close col- laboration with Mopar and engineers from the motorsports community. The engine and kit's distinctive Helle- phant logo provides a nod to the brand's past and present, according to the com- pany. The logo and name call out the leg- endary 426 Hemi engine, first introduced in 1964 and nicknamed the Elephant engine for its power and size, as well as the 707-hp Mopar Hellcrate engine kit, revealed at the 2017 SEMA Show. The complete engine assembly includes a water pump, flywheel, front sump oil pan, supercharger with throttle body, fuel injectors and coil packs. The crate engine assembly can be paired with the Mopar Hellephant 426 supercharged Mopar crate Hemi engine kit for a relatively simple plug-and-play setup by experienced installers, according to Mopar. 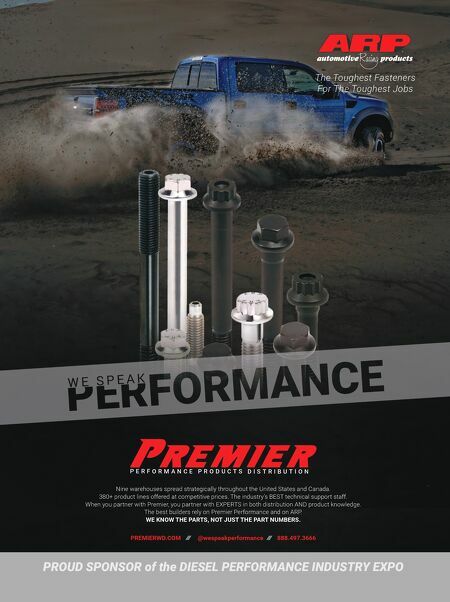 The engine assembly and kit are designed for installation on pre-1976 street and off- road vehicles. Additional features of the Hellephant engine include valve covers imported from the Dodge Challenger SRT Hellcat Redeye, and valvetrain, valves, locks and retainers pulled from the Dodge Challenger SRT Demon. The engine build includes a special high-lift cam and custom-forged pistons. The installation kit features a powertrain control module (PCM), power distribution center, engine wiring harness, chassis har- ness, accelerator pedal, ground jumper, oxygen sensors, charge air temperature sen- sors, fuel pump control module and CAN bus interface device. The PCM is unlocked. As with the Hellcrate engine, Mopar will also offer an essential Front End Accessory Drive (FEAD) kit, which includes an alter- nator, power steering pump, belts, pulleys and more. EDITOR'S NOTE: This ar ticle originally appeared on THE SHOP's website. Sign up for our free eNewsletter that brings all the industry news to your inbox daily at theshopmag.com. 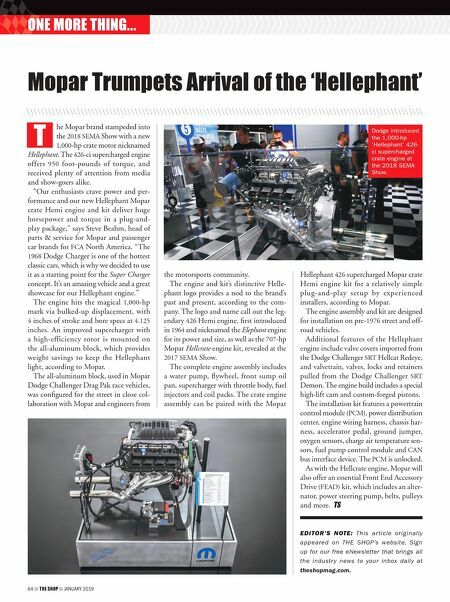 Mopar Trumpets Arrival of the 'Hellephant' T \\\\\\\\\\\\\\\\\\\\\\\\\\\\\\\\\\\\\\\\\\\\\\\\\\\\\\\\\\\\\\\\\\\\\\\\\\\\\\\\\\\\\\\\\\\\\\\\\\\\\\\\\\\\\\ ONE MORE THING... Dodge introduced the 1,000-hp 'Hellephant' 426- ci supercharged crate engine at the 2018 SEMA Show.